Thanksgiving dinner wouldn’t be complete without stuffing. However, traditional stuffing seemed a little boring to me this year. I always think of YOU before creating a new recipe because I want you to be healthy AND enjoy the food you eat. Well, you’re probably tired of me professing my love for fresh fruits and vegetables. I can’t help myself! If juicy, crisp apples are perfect in my Creamy Apple Oatmeal, why wouldn’t they be fabulous in stuffing? Throw in some crunchy celery, herbs and savory breakfast sausage… and WALLAH! Fluffy stuffing with apple sausage that might steal the spotlight of your main dish this Thanksgiving. In a large pot over medium heat, add oil and heat for 1 minute. Add celery and onion. Cook until onion is translucent about 3 to 4 minutes. Add chicken stock, parsley, thyme, salt and pepper. Bring to boil. Meanwhile, brown sausage and chop apple. Once stock mixture is boiling, add bread crumbs and stir well. Add browned sausage and apples and mix well. Lightly spray 11 x 7 baking dish with olive oil cooking spray. Scoop stuffing in baking dish and spray lightly with cooking spray. Bake stuffing at 350° for 30 minutes or until top is golden brown. If you would like your stuffing really soft, just add 1/2 cup additional chicken stock to recipe. I’m creating your perfect Thanksgiving menu because you have enough to stress about until then (are the in-laws coming into town?). Since I’m going to be cooking several more healthy, mouthwatering Thanksgiving dishes, I needed this adorable apron to get me in the Thanksgiving spirit. 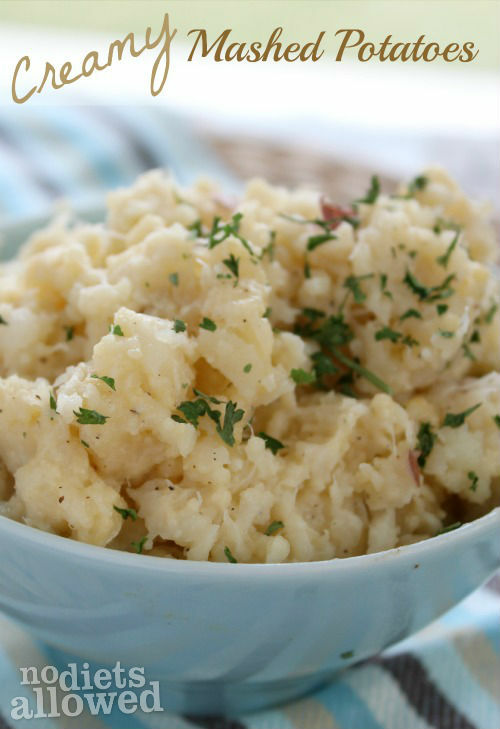 Have you already check out my Creamy Mashed Potatoes? You make healthy food look & sound good! Pinned! You just made my day, Amber! Thank you for such a great compliment. I LOVE making healthy food taste good. Thank you, Becky! The apples and sausage make this stuffing extra tasty. I recently became a fan of the apple sausage combo. This sounds so so so yummy! Saving for thanksgiving for sure! Thanks, Jesseca! 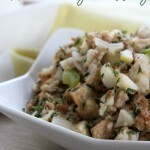 The diced apples and sausage are so tasty in this stuffing. Yes and YES!!! This (and the mashed potatoes) looks AH-MA-ZING! You better believe I’m pinning this! !